Yes, just a touch. I think I've been too busy lately to stop and smell the pumpkins. 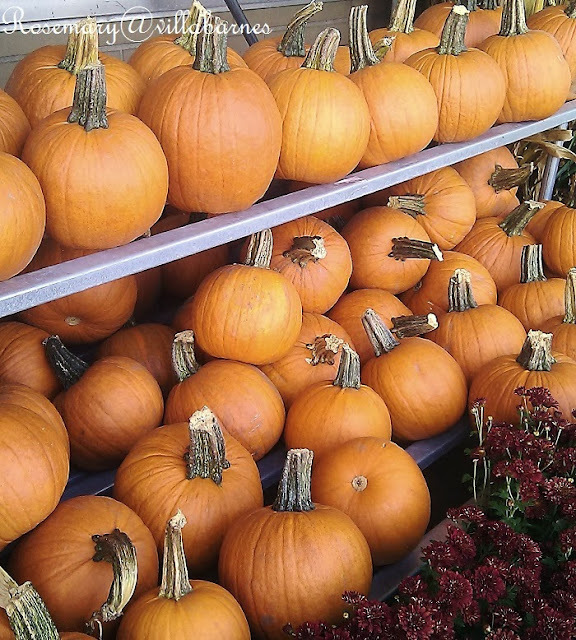 I took this photo of blue (actually more on the grey side) pumpkins at a local grocer. I love the color. So, would you decorate with the blue pumpkins, or, are you more traditional? Although Fall is my favorite time of year, I actually don't do that much in the way of Fall decorating. Which is why you haven't seen any big Fall posts from me. I've noticed that my "Fall" post from two years ago, is getting pinned a lot. I find that interesting. 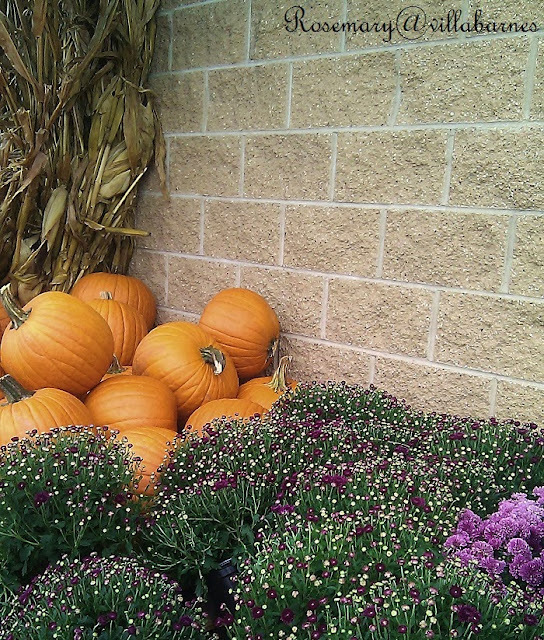 Because, in that post, I also shared how I don't do that much in the way of Fall decorating. 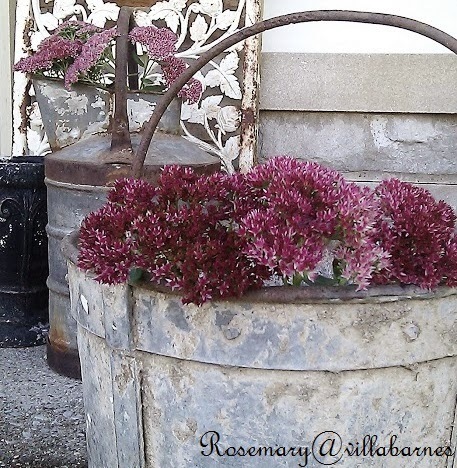 and, a little autumn joy in galvanized containers. I know a lot of you have been getting your Fall decorating on. I've enjoyed seeing all the beautiful vignettes, and home decor. But, how many of you are like me? A few touches, and, done. The fall pictures of yours keep getting pinned because they are beautiful. I actually gear up in the decorating during the fall and feel festive until the New Year is over. Although I have used several orange pumpkins outside, I use the blue and white inside...it's just a matchy, matchy thing with me and I really prefer the softer touch inside. I normally love to decorate for fall but this year no go. I really DID want blue and/or white pumpkins. What grocer did you find them at? I've come up empty. That's me, Rosemary, this year anyway. I didn't have a lot of Fall décor to begin with but I kept it fairly simple with touches here and there. 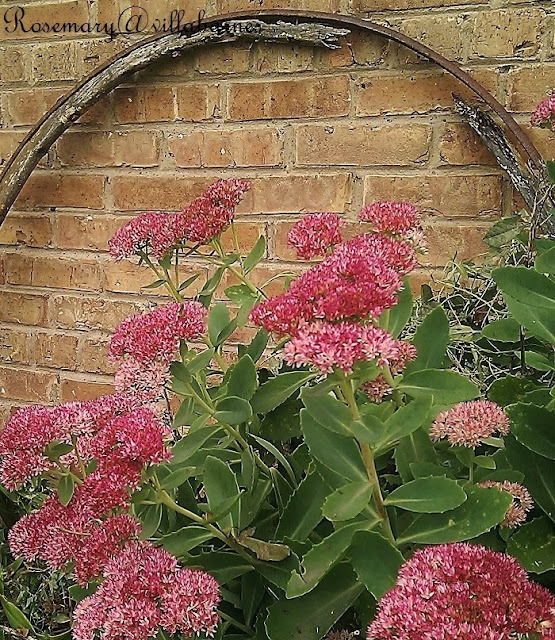 I think I did more outside the front door then I did in the house! I love a mix of both the blue and orange. just can't be Fall without a little orange!! Don't know if I'd decorate with blue/gray pumpkins. I've tried to do low color decorating because all the pictures of rooms in white or gray look so pretty, but color just takes over. I seem incapable of low color decorating. So orange pumpkins it is... if I get around to it. I love decorating for the seasons or holidays, but like you, I'm often too busy. Like this year. And the pictures of your 2 years ago post? Gorgeous! No wonder they're repinned a lot! I cant believe we are in October already. I have not got my pumpkins yet or been to the pumpkin patch. I dont do a lot of seasonal decorating but normally by now I have finished with what I am going to do. Hopefully this weekend I will get inspired. 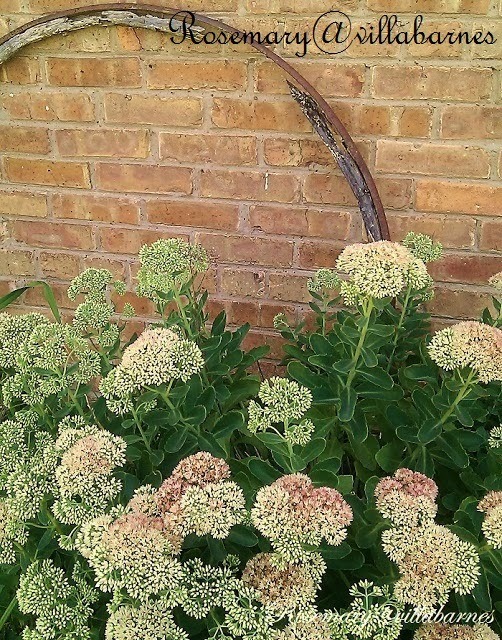 I'm loving those grayish pumpkins this year and also have autumn Joy planted here and there in my yard to enjoy this time of year. Those are beautiful! A few touches and I'm done for sure. 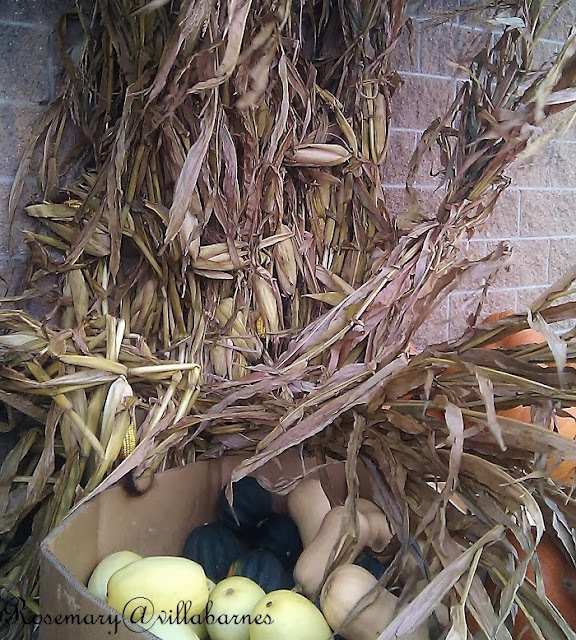 I love the blue-grey pumpkins and have used them for several falls now. They last a very long time too. One year it was fall again and my large pumpkin was looking like the day I bought it (a year ago) lol. If we had access to those pumpkins I would buy them for sure!! Love all your photos of inspiration!!! I'm usually good with a few touches as well...but since this is my first fall as a blogger I've been getting a little more into it! I actually just bought some small white pumpkins/ gourds for the first time yesterday! Love your photos! I love blue pumpkins...never ever thought I's say that. A couple of years ago, my husband and I were hosting the rehearsal dinner for my son and his bride's October wedding. I didn't want to do the typical orange, yellow, rust color scheme. Lucky me, I have a daughter who is an art teacher and and an interior designer. She did a wash of white, blue and a pinch of silver on pounds the pumpkins and I bought pots and pots of deep plum mums. We used deep plum candle arrangements on all of the tables, my daughter did all of the draping, etc. Tt was the most elegant of settings for a perfect Fall rehearsal dinner. Yes, that describes me well! I used to go all out, but as I've gotten older, I do less each year it seems. I haven't bought any pumpkins yet this year. I will though eventually. I probably won't buy mums because they don't last very long for the money. I did plant pansies though. I like the white pumpkins and the Cinderella ones the best, but will have an orange one for carving on Halloween. I bought four tiny pumpkins today, but have yet to pull out any of my fall decor. The time seems to speed past and I am busy with other things. The most pinned post of yours is because of the wonderful textures. And the animal! Blue and white pumpkins are my favs. I have some tan squatty ones this year to do stuff with - need to get at that! Wow I was sucked right into this post with that first picture! Love those pumpkins so much. 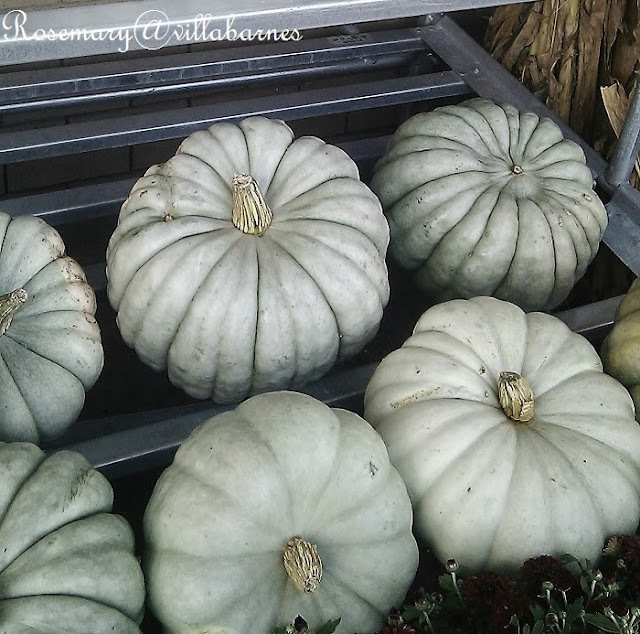 Hope you will stop by my blog and see my latest post about the pumpkins I chose this year and how I displayed them! Just like you a few touches and I am done! 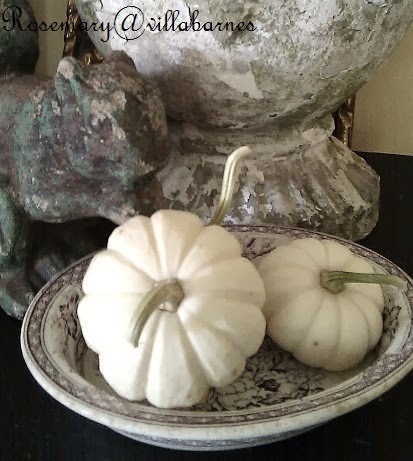 Pumpkins here and there in my house.Pretty and simple....and they should last until Thanksgiving.And sometimes I hate to throw them out because they still look good!